You may have heard the term EV Training but not understood what it means, or you may have a basic understanding of it but would like a refresher or to find good spots to EV Train. This guide is all about getting those Effort Values flowing, so read on if you’d like to know how to power up your Pokémon by the process of EV Training. This guide does NOT apply to Pokémon Let’s Go! Pikachu & Eevee, nor does it apply to Generation I or Generation II games. EV stands for Effort Value. It has nothing to do with training a bunch of Eevee, but it instead describes the process of training up your Pokémon’s stats to optimize them for competitive battling. Imagine your Pokémon’s stats. There’s HP, Attack, Defense, Special Attack, Special Defense, and Speed. Each of these stats also has a special, invisible number that is referred to by the Pokémon community as Effort Values, as these were required in order for a Pokémon to earn the Effort Ribbon starting in Ruby & Sapphire. Officially, these are referred to as base stats in-game, but almost no one uses that terminology and it is also confusing given the more widely understood definition of base stats that you will see listed on Pokémon fansites Pokédex pages — the base values for each stat that determine how strong a given species of Pokémon is. Think of Effort Values — EVs — like Experience Points. Your Pokémon gain them when they fight against other Pokémon, whether it’s a wild battle or a Trainer battle. If it’s a battle where you’d normally gain Experience Points, it’s a battle you’ll gain Effort values from — so fights against other players or in facilities like the Battle Tower, Battle Frontier, etc. do not earn EVs. The amount of EVs you earn from each battle depends on the Pokémon you knock out — Pokémon can give anywhere from 1–3 EVs total, and some may give EVs to multiple stats. A speedy Pokémon like Zigzagoon, for instance, gives 1 Speed EV for each one you knock out. Its evolution, Linoone, gives 2 Speed EVs. A Pokémon like Masquerain gives 1 Special Attack EV and 1 Special Defense EV. Again, think of these like Experience Points, except you gain them for each of the six stats. All Pokémon that participate in a battle or otherwise gain EXP receive the full amount of Effort Values that the fainted Pokémon awards — this amount is not split or otherwise decreased. However, any modifiers to the Effort Values each of your Pokémon earn only affect that Pokémon, so if there’s an effect that doubles the EVs your lead Pokémon earns, other Pokémon that participate in the battle only receive the original amount. Pokémon that do not participate in the battle will receive no EVs. Additionally, in Generation III games, Pokémon at level 100 gain cannot gain any further EVs. Each stat that each individual Pokémon has starts at 0 EVs in it and can have a maximum of 255 EVs (or 252 EVs starting with X & Y). The total number of EVs across all six of the Pokémon’s stats cannot exceed 510. 510 is the effective cap for your Pokémon’s EVs, which is enough to raise two stats to 255 (although, for reasons explained later, you wouldn’t actually want to go higher than 252 for any stat). Why Should I EV Train? So you’ve now learned that Pokémon gain EVs after fighting against Pokémon and that there are EVs for each of the six stats, but what do these EVs actually do? Effort Values raise your Pokémon’s stats. The amount that it raises a given stat by is based on your Pokémon’s level, but for a level 100 Pokémon, it will receive +1 point in a stat for every 4 EVs it has in that stat, rounded down. Just to be clear, since this misconception comes up a lot: that doesn’t mean as soon as your Pokémon reaches level 100 it gains all of those extra points at once — the gains from Effort Values affect a Pokémon’s stats at every single level, proportionately. Let’s take a level 100 Garchomp, for example. If this Garchomp has 0 EVs in Attack and has a neutral nature, then its maximum Attack stat would be 296. If this Garchomp instead has 255 EVs, it would have 63 points higher in Attack than one with 0 EVs, meaning it would have a much more fearsome 359 Attack. If it has a nature that raises its Attack by 10%, such as Adamant, it could reach as high as 394 Attack (keep in mind that the 10% bonus from positive natures applies after the EVs are calculated, meaning you get an even higher amount than +1 per 4 EVs). As you can see, EV Training is quite beneficial for maximizing your Pokémon’s stats. It’s important to be reminded that all benefits from Effort Values are rounded down, so in the example above, a Garchomp with 252 EVs in Attack would receive the same benefit as one with 255 EVs in Attack — 63 extra points, assuming level 100 with a neutral nature. That’s because 252 ÷ 4 = 63 while 255 ÷ 4 = 63.75, but since this number is always rounded down, it would be reduced to 63 as well. That means, instead of going with 255 EVs in two separate stats, you could instead put 252 EVs in two stats and then the remaining 6 EVs in a third stat (although only 4 EVs matter). You squeeze one extra stat point that you wouldn’t have otherwise gotten, which may make a difference in a close battle. In Pokémon X & Y and all subsequent versions, the cap for any individual stat’s EV is 252 instead of 255, so this is less of a concern in newer games than older games as you won’t end up with “wasted” Effort Values. What Happens If I Don’t EV Train? One problem with the whole EV Training process is that it pretty much has to be planned out in advance. If you’ve played through a Pokémon game with your team of Pokémon without thinking anything about EV Training, your team still will have gained EVs from all of the Pokémon they’ve fought, but you’ll have no clue how they are distributed and they won’t be optimally invested in the stats you want to boost. Because of this, it’s STRONGLY recommended that you only consider EV Training freshly-caught or freshly-hatched Pokémon, not any Pokémon that you’re playing through the game with normally! While there are ways in some games to reset your EVs entirely, it’s often a hassle to do, and in some games may be impossible. Thankfully, you do not need any EV Training to get through any of the main games! In single-player experiences, the only time you’ll need EV Training is if you want to tackle some of the challenging facilities like the Battle Tower, Battle Maison, Battle Tree, etc., because in the later rounds there, all of the Pokémon you fight against will be EV Trained. But if you do not properly EV Train your Pokémon, they will not stand a chance in any official or even unofficial Pokémon tournament. They’ll plain and simple be outmatched. It’s like playing a game of chess except you don’t start with your Queen or either of your Rooks. I’m not saying this to make you feel bad, inadequate, or to tell you how you have to play the game — I’m trying to save you money, because most official VGC tournaments cost a substantial amount of money, and you just plain and simple will not stand a chance in these events if you don’t EV Train your Pokémon, no matter how much you love your team. That’s just the reality. It’s also important to remind you that… You don’t NEED to EV Train to HAVE FUN! If all of this goes completely over your head, don’t let that stop you from enjoying the Pokémon games as a whole, because you can still do so just as you always have. EV Training is geared towards players who want to step up their game and take their gameplay to the next level. In order to properly EV Train, you should first plan out your EV Spread for the Pokémon you’re trying to train. You have 510 points to work with, so determining how to distribute them — the EV Spread — should be your first priority before starting. If you’re new to EV Training, you’ll probably find the most benefit from sticking to simple 252/252/6 spreads — that means 252 EVs in one stat, 252 in another, and then 6 in the final stat, which is usually HP. 252 Attack / 252 Speed / 6 HP for Physical-based “sweepers” such as Garchomp. 252 Special Attack / 252 Speed / 6 HP for Special-based “sweepers” such as Gengar. As you learn more about EV Training and the dynamics of your competitive team, you’ll experiment with more varied spreads, but these four examples should give you an introduction to how EV Spreads work. Once you’ve determined which EV Spread you want to use for your Pokémon, you need to figure out which Pokémon you can repeatedly fight give you only the EVs you need. It’s easiest to focus on one stat at a time while EV Training, although as you get more advanced in your knowledge of EV Training, you might be able to figure out ways to train up the stats you need in a more optimal manner. There are a few items or features you can get that help speed up the process of EV Training, though, and are strongly recommended before starting the process. If you don’t have access to some or all of them, that’s fine, but it will just take longer to finish EV Training. Also, please note that the methods you see below are generally common across all versions — there may be other methods that are available only in certain versions that aren’t listed directly below. A quick, albeit expensive way to give your Pokémon a boost to its Effort Values is by feeding it vitamins. You’ll find these vitamins scattered around the world as well as for sale in select shops in each region. The catch is that they’re rather expensive — 9,800 Poké Dollars each! — so they may not be worth buying in every Pokémon game they’re available in. Each of these vitamins raises the Effort Values of the respective stat by 10 each time they’re used. However, they will not raise any stat’s Effort Values higher than 100, so if you use an Iron to raise a Pokémon’s Defense when it already has 95 Defense EVs, it will raise it to 100. If you use any more Iron past that point, the game will say something along the lines of “it had no effect,” which will not raise that Pokémon’s Effort Values. Additionally, using vitamins on a Pokémon with the cap of 510 total EVs will result in that same message being displayed and will have no effect. If you have the money, this will reduce the amount of time you need to spend fighting Pokémon to EV Train. However, remember that it also takes time to earn money, so you’re better off ignoring vitamins unless you have a lot of excess cash to spend, because otherwise you’re better off just investing that time earning the 100 EVs per stat you’d gain from vitamins by fighting Pokémon instead. Some games make it very easy to earn a lot of money very quickly, such as Diamond, Pearl, and Platinum thanks to the Gentleman and Socialite on Route 212 and X & Y thanks to the Battle Chateau or the various restaurants. Other games may allow you to buy vitamins for a very small amount of Battle Points (BP). It’s up to you to determine whether or not vitamins are a worthwhile option for you. The Macho Brace is a Held Item that, when held by a Pokémon, doubles the amount of Effort Values it earns from the battle. The downside to this is that the Pokémon’s actual Speed stat is temporarily cut in half while the Macho Brace is held. It’s really, really important to understand that the Speed decrease will not have any permanent effect on the Pokémon holding the Macho Brace. Think of it like what happens if a Pokémon uses String Shot on your Pokémon. The in-game wording doesn’t explain this very well and has caused a lot of players undue worry. Keep in mind that the Macho Brace will not increase the EVs gained from sources that aren’t battles, like vitamins or wings. Additionally, if a Pokémon holds the Macho Brace, it only affects the Pokémon actually holding the Macho Brace — it doesn’t double the EVs other Pokémon in the party gain. Introduced in Pokémon Diamond & Pearl and available in every main series game since then, the “Power Items” are a set of six Held Items that give a bonus amount of EVs for their respective stat. They have a similar side effect of temporarily lowering the holder’s Speed stat while it’s held, but this has no permanent effect. Power Lens for Special Attack. Power Band for Special Defense. In all versions up except for Sun & Moon and Ultra Sun & Ultra Moon, these items each give the Pokémon holding it a +4 bonus to the respective stat’s EV whenever it gains EVs. This is regardless of if the fainted Pokémon gives that specific EV, so for instance, if a Pokémon holding a Power Bracer knocks out a Wingull (1 Speed EV), then it would gain 1 Speed EV from the Wingull and then 4 Attack EVs from the Power Bracer. Ideally, you will be using the Power Item while fighting a Pokémon that gives the same stat as the Power Item, resulting in 5 EVs (or 6 EVs for a Pokémon that gives 2 EVs for that stat). Starting with Sun & Moon and continuing into Ultra Sun & Ultra Moon, the Power Items give a +8 bonus to the respective stat instead of a +4 bonus, making EV Training using this method reasonably fast. Something very beneficial to speed up EV Training is a very rare “infection” called the Pokérus. After every battle, whether it’s against a wild Pokémon or Trainer, there’s a 3 in 65,536 chance (approximately a 1 in 21,845 chance) that a Pokémon in your party will contract the Pokérus virus. You can tell if your Pokémon has contracted the Pokérus by a purple icon or status symbol while looking at its stats that says either “PKRS” or “Pokérus”. Additionally, when you contract the Pokérus for the first time, after healing your Pokémon at a Pokémon Center, the nurse will tell you that your Pokémon are infected with the Pokérus. This is NOT a bad thing! Thankfully, the Pokérus is a beneficial virus that doubles the amount of Effort Values that Pokémon earns. Permanently. It won’t mess up your save. It won’t hurt your Pokémon. It doesn’t mean they’re going to die if you don’t cure them. Its sole effect is to speed up EV Training. As long as you see the “PKRS” or “Pokérus” symbol in the status screen, that Pokémon’s Pokérus is contagious, meaning it will eventually spread to other Pokémon after every battle (whether you fight or run). Once you’ve contracted it once, if you take the appropriate steps, you will always have it available. It’s very important to understand that this contagious phase does not last forever! Pokémon will get “cured” of the Pokérus after between 1 and 4 real-world days while they’re in your party. Once a Pokémon has been cured of the Pokérus, it will no longer spread to other Pokémon and you’ll instead see a little smiley icon on the Pokémon’s status screen instead of the “PKRS” or “Pokérus” symbol. It will still always gain double the usual amount of EVs, even after it’s cured. The only downside is that it will no longer spread. What you should do when you contract the Pokérus is to spread it to every Pokémon in your party as quickly as possible, but then also take several Pokémon that you don’t plan on using from your PC, spread the Pokérus to them by withdrawing them from the PC and having them in your party while fighting against wild Pokémon, and then deposit them to keep your strain of the Pokérus intact. That way, if ever you need the Pokérus again, you can just withdraw an infected Pokémon and use it to spread the Pokérus to Pokémon you’re interested in EV Training. With the arrival of online trading, obtaining the Pokérus isn’t as hard as the odds may suggest, unless you are not able or otherwise unwilling to trade with other players. Most people will be glad to help give you an infected Pokémon they have. It just requires a bit of communication and negotiation. Lastly, one other important thing about the Pokérus and its EV doubling effect: that 2× multiplier is after any other bonuses, so that means an infected Pokémon holding any of the Power Items will gain +8 for a given stat instead of the usual +4 without the Pokérus (or +16 in Sun & Moon onwards). Pokémon that give 1 EV for a stat will now give 10 EVs ((1 + 4) × 2) when holding the matching Power Item and Pokémon that give 2 EVs for a stat give 12 EVs ((2 + 4) × 2) instead (18 EVs and 20 EVs respectively in Sun & Moon onwards). When the Effort Value system was first introduced in Ruby & Sapphire, there was no way to remove or reset a Pokémon’s Effort Values — they were permanent. In Emerald and all future versions, certain berries gained an effect that removes Pokémon’s EVs, giving you a possible way to reset your Pokémon’s EVs. Pomeg Berry lowers HP EVs. Kelpsy Berry lowers Attack EVs. Qualot Berry lowers Defense EVs. Hondew Berry lowers Special Attack EVs. Grepa Berry lowers Special Defense EVs. Tamato Berry lowers Speed EVs. Each of these berries lowers the respective stat’s EVs by 10 when fed to a Pokémon. In Diamond, Pearl, Platinum, HeartGold, and SoulSilver (no other games), if the Pokémon fed one of these berries has more than 100 EVs in the corresponding stat, it will instead lower that stat’s EVs to 100. Unfortunately, these berries can be a pain to grow and 50+ berries are necessary in order to fully reset a Pokémon’s EVs. This makes these berries impractical in most Pokémon games, especially games where berries are harder or impossible to grow. For instance, in Black & White and Black 2 & White 2, you can no longer grow berries due to the Dream World being shut down. All of the 3DS games are good for growing berries in, though, especially Sun & Moon and Ultra Sun & Ultra Moon — X & Y and Omega Ruby & Alpha Sapphire don’t need them as much as there is an even more potent Reset Bag available from Super Training to instantly reset the Pokémon’s EVs to 0. A very important part about EV Training is knowing the best spots to train, since you need to fight only Pokémon that give you the EVs you want to train. 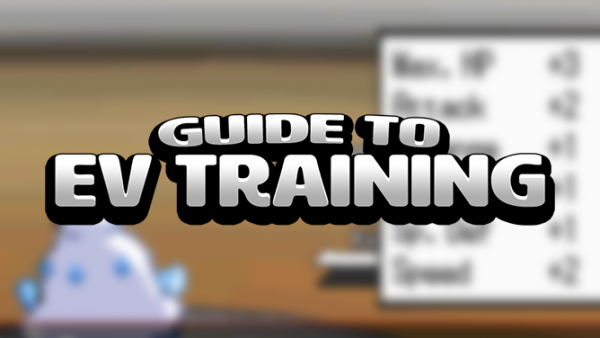 Every game will have different spots that work well and optimal methods, so I’ve broken the rest of this guide up by games so you can easily find how to EV Train in the game you’re playing.